Xtreme Distance is the only event in the Hyperflite Skyhoundz Xtreme Distance Championships (Xtreme Distance Qualifiers, Xtreme Distance International Qualifiers, Xtreme Distance European Championship, and the Xtreme Distance World Championship). Xtreme Distance competitions give canines exactly what they want – insanely long throws and are stand-alone events meant to showcase the pure speed and catching ability of canines and the throwing skills of the human team member. Teams compete in two divisions (Men's and Women's) in four distinct classes (MicroDog, Light Plastic, Classic Plastic, and Unlimited Plastic). All teams compete in one 90-second round (as many throws as a team can make within the 90-second throwing period). Click image on right for larger view. MicroDog — (Competition Standard Pup Disc, FrostBite Pup disc, SofFlite Pup disc, Jawz Pup Disc, Jawz HyperFlex Pup disc, or Jawz X-Comp Pup disc). 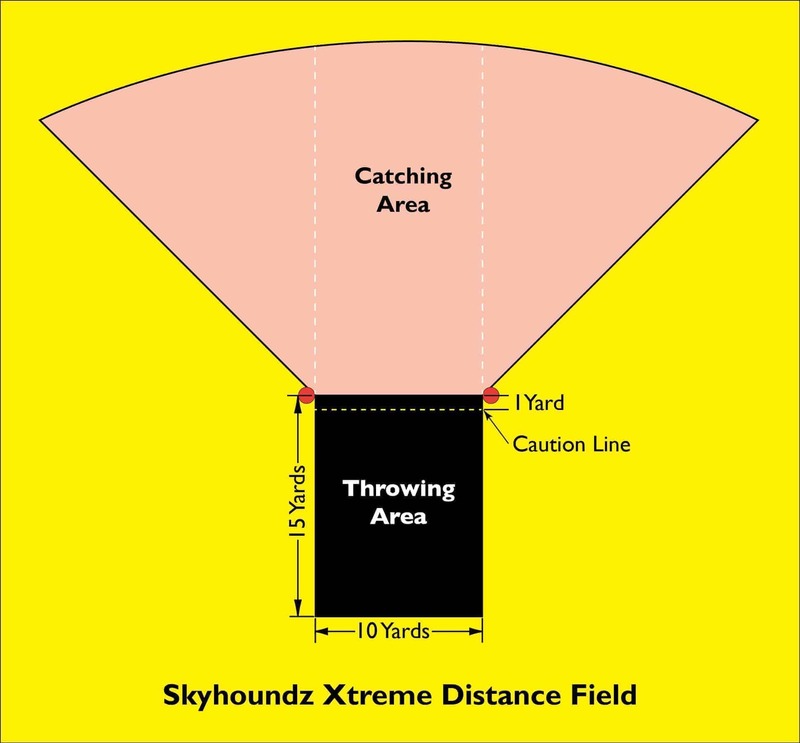 The recommended minimum field set-up for Xtreme Distance is a flat, grassy rectangular area, at least 50 yards x 110 yards (45.7 meters x 100.6 meters) [Ten yard (9.1 meter) throwing line with 15 yards (13.7 meters) of space behind the throwing line to allow for dog acceleration], that is free of obstructions. A caution line (dashed and/or different color) can be added one yard behind the throwing line in order to help prevent throwing dog/foot faults. The location of the throwing line and orientation of the field will be determined in the sole discretion of the event host. Once the throwing line is determined it will remain the same for all competitors throughout the round. Note - wind direction is a variable that competing teams must be prepared to deal with. 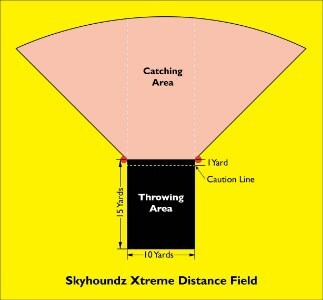 Xtreme Distance Qualifier field set-ups may require throwing into the wind, with crossing wind, or with tail winds. Unlike other canine long distance events, canines must not cross the throwing line until the disc leaves the thrower's hand or a throwing fault will be called. The thrower may not step on, or over, the line at the time of the throw or a foot fault will be called and the throw will not be scored. A canine may be restrained, anywhere within the throwing area, with the aid of a helper, if desired. 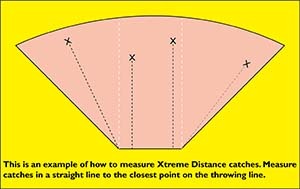 Catches will be measured, by straight line, from the closest part of the throwing line (regardless of where on the throwing line that may be) to the point where the rear-most paw of the canine contacts the ground at the time of the catch, or, if the catch is made in the air, the point where the rear-most paw of the canine contacts the ground after the mid-air catch. Special Rule for Tipped Throws – A throw tipped by a canine, and later caught, is still a measurable throw. However, the Point of Contact Rule applies to prevent a canine from gaining an unfair advantage owing to the extra distance attributable to the tip. The Point of Contact Rule states that a tipped throw that is subsequently caught by a canine, will be measured to the point where the rear-most paw of the canine is at the time of the tip, regardless of whether the canine is in stride or airborne. If a disc leaves the thrower's hand before time is called, and a catch is made, it will be scored. Competitors may change discs between throws as long as the discs are appropriate for the Class in which the competitor is competing. On-deck Xtreme Distance teams, when called must immediately proceed from the staging area, to the throwing area (human and dog must enter at the same time). Once the team enters the throwing area, a "prepare to throw" 15-second warning will be given. Time will begin on the team's first throw, or once 15 seconds have elapsed, whichever comes first. Competing teams will then have 90 seconds in which to complete as many attempts as desired. There will be a maximum warm up time of 10 minutes before each Division begins: MicroDog Division, Light Plastic Division, Classic Plastic Division, and Unlimited Plastic Division). The countdown will be: "60 seconds, 30 seconds, 10 seconds, 5 , 4 , 3 , 2 , 1, time!" Competitors should keep track of their own time while competing and not rely solely on official time callouts which might be interrupted should technical problems occur. Click here for a free download of our 90 second countdown timer. If you would like to hear the countdown timer, click on the play button below. 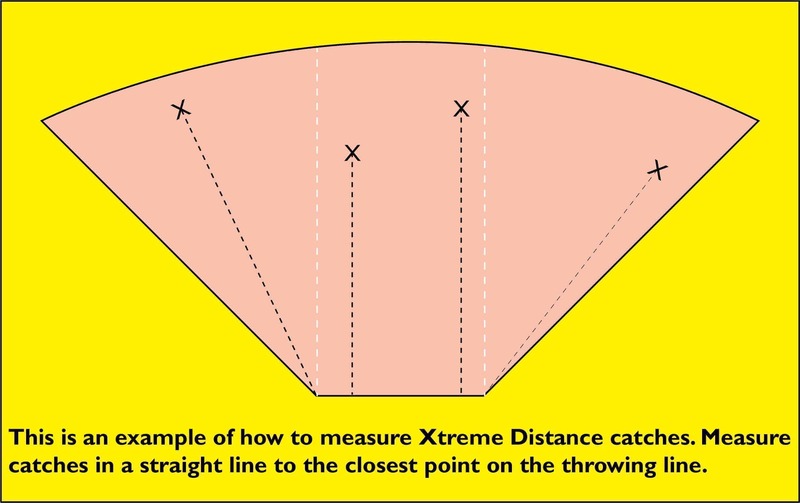 If there is a tie for first, second or third place, the tie will be broken by the following criteria, as necessary: 1) A Face-off round with each team receiving one Xtreme Distance throw. The team completing the longest distance catch will be declared the victor. If the teams are still tied after each has made one throw, Face-off continues until one dog completes a longer distance catch than the other. Officials will permit the competitors to rest their dogs as necessary.